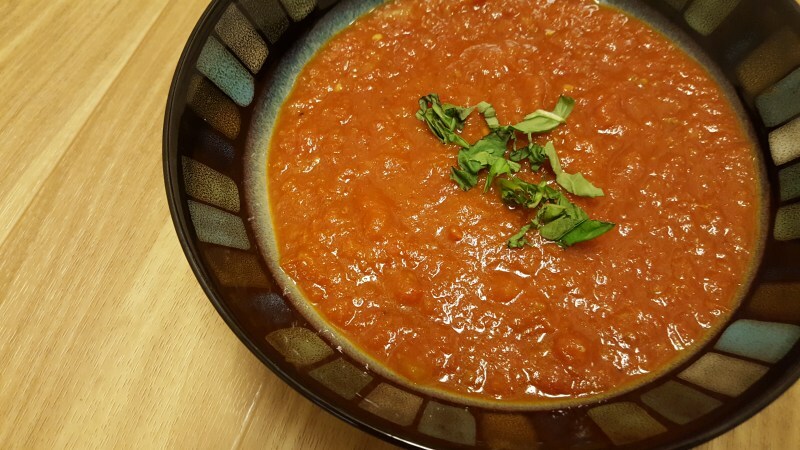 This is your very super basic tomato soup. It’s earthy and comforting and warm. I’m always skeptical of vegan dishes but despite not having any dairy (yes, no butter or cream!) the texture of the soup is creamy and thick. I accidentally had a bit of a heavy hand on the red pepper flakes but when enjoyed with a crusty piece of bread the extra spice was just right. Preheat oven to 375. Cut plum tomatoes into quarters and cut the onion into large chunks. Lay the tomatoes, onions, and garlic onto a large baking sheet lined with parchment. Drizzle with olive oil and season generously with salt and pepper. Roast for an hour and allow to cool. Once the roasted tomatoes have cooled transfer to a medium-sized pot over medium heat add in more garlic, red pepper flakes, salt, pepper, tomato paste, chopped basil, red wine, chicken stock and balsamic vinegar and stir to combine. Allow the mixture to come to a boil and then reduce to low and allow it to simmer for 30 minutes. Once cooked use a stick blender to puree to desire consistency. Taste and season with additional salt and pepper as needed.